Scratching and 'nibbling' at feathers is part of the normal grooming process of birds. Running the feathers through the beak aligns the feathers and helps spread oil evenly throughout the plumage. However, when a bird furiously scratches or pulls at feathers it is more likely that the bird is itchy than preening. There may also be behavioural problems in some birds which lead to excessive grooming or selfmutilation. If the bird is scratching excessively it should be checked for external parasites, such as lice, which may be caught from wild birds visiting the cage. Birds with lice often have patchy feathers and will scratch and bite incessantly trying to get relief from the tormentors. Treatment for lice is readily available from local veterinarians and pet stores. It is important to treat the cage as well, as lice also live in dark crevices in the cages. If the bird continues to itch after external parasites have been eliminated as a cause, a visit to a local veterinarian or avian (bird) specialist may be needed to eliminate other causes. Internal parasites, yeast infections, injuries and cysts are often causes of birds chewing at their feathers. Feather picking in Sulphur Crested Cockatoos can result in birds becoming almost naked. The causes are varied but in many cases the problem starts with boredom. Cockatoos in the wild are members of a flock and the solitary bird kept in a cage without sufficient company or stimulation may resort to pulling feathers. The plucking and chewing of the feathers results in damage to the skin which becomes itchy and the bird in turn creates more damage by biting the skin. It is important that parrots are housed in a cage large enough to allow them to stretch their wings and to climb. These intelligent birds will enjoy playing with parrot toys available in most pet stores. It is important to provide the large parrots with toys specifically designed for the larger birds as they will quickly destroy smaller toys and may cause themselves harm by swallowing plastic or small components. Parrot toys are often `parrot puzzles' designed to keep the parrot occupied. In the wild parrots eat a wide variety of seeds , fruits and sometimes insects which they must seek out. They often work hard to extract the seeds from the pods or cones of plants. 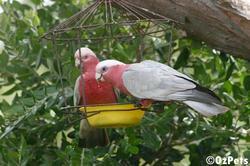 Providing the caged parrot with a variety of seeds and fruits will help to prevent boredom.